San Diego Roller Derby vs. OC Rollergirls – Our First Bout of Our 2010 Season! The lights shined, the girls looked amazing in their new skirts, designed by team member IcePax,undeniable buzz of excitement in the air of Skateworld. San Diego Roller Derby (SDRD) was about to skate in our very first home bout ever! With none of the team members having any experience in running a bout, the preceding months were filled with hard work, research, and late nights to assure that bout production ran smoothly. The hard work was about to show itself off in front of a packed house of almost 700 spectators – which we were determined to turn into SDRD fans. The SDRD Starlettes welcomed the Orange County Rollergirls (OCRG) to our “house” for our debut home game and were filled with a sense of pride and a healthy dose of nerves. Our training since our last bout against the Derby of Bakersfield in November has been nothing less than intense. Our coach B-Stang has been amazing, we would be nowhere with out him. Our practices focused on endurance and fundamental skating skills. “A strong skater makes a good derby player”, we are told time and time again. Practicing strategies, knowing the game, and learning the rules thoroughly were part of our plan to play a clean game. Knowing that OCRG was going to be our toughest challenge to date, staying focused in our practice was our goal. We knew our task ahead was going to be no walk in the park, these were experienced, well trained skaters were were preparing ourselves to go up against. The adrenaline was flowing through our veins, and the tension was high, as SDRD knew that we had a long battle ahead of us on Saturday evening of January 23rd of 2010. As the jammers flew off of the line OCRG proved to be a match for our defense and held our jammers in the pack and kept them from scoring for the first couple of jams. Power blockers Lady Diesel and Rumble Pie soon came out swinging and paved the road for the Starlette jammers to put some hard earned points on the board. “Diesel is like a force to be reckoned with”, an OCRG girl was overheard saying later that night at the after party. SDRD jammers, Wonder Whoop’em and Dorothy Dangerous as a testament to their strong fundamental trainers, were quick on their feet, avoiding numerous blocks from OCRG’s own heavy hitters and maneuvering through the tough pack. Robyn Urpride and Wicked Angel, both played their first games as Starlettes and made their new team members proud. 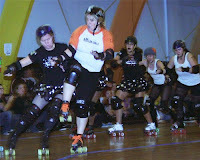 Flown in from Ohio was SDRD’s very own Holley Car Brader who played her usual heavy hitter and jammer without a hitch. As this was her last game with SDRD Holley will be sorely missed by her teammates but not so much by the opposing teams. 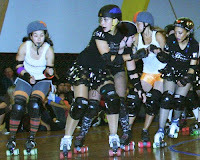 Also on the line-up was Icepax with her fancy-footed jamming skills and Juno Escareme as a great blocker/ jammer combo. Blockers like St. Val Massacre show that we have some heavy hitters of our own and are not going down with out a fight. OCRG lived up to the high expectations that we had for their team. They kept the pack fast and our endurance that we have been working so hard on was put to the test. We were thankful for the hours we spent sweating in the rink with high endurance in mind. OCRG held the lead with SDRD fighting hard to close the gap within 9 points more than once. There was no lack of blood, sweat and heart out on the track. We gave it our all, being motivated by the cheers of our new fans was a new and fantastic experience. When all was said and done, SDRD didn’t win our first home bout. With a final score of 56–103, we gave it our all but in the end OCRG came out on top. Our score may have been small but our hearts are big. We fought by tooth and nail, gave it our all, and learned a lot. This experience is only going to make us work harder and become stronger together. It has strengthened our determination and made us hungrier for a victory. We will continue to give our all every practice and train hard for every bout. With Coaches like B-Stang and Gary Stang on our side – and legends like John Hall in our corner – we can only get better with each passing practice. In the end we were happy about the $350 that we earned for the International Rescue Committee, the charitable organization that we hosted at our first home bout. That combined with the amount of love and support that we recieved from our families, friends, and fans made us feel like winners even as OCRG was doing their victory lap. Thank you to all who came, cheered, screamed, and made it all worth it. This season is just getting started – you haven’t seen anything yet! Get your signs ready, rest your voices, and get set to come see us take on the Inland Empire Derby Diva on our home turf, Skateworld, San Diego on Febuary 27th 2010. Now you can get your tickets online by using the “But Tickets” link on the right. No more waiting in line on bout day! SDRD members can also sell you some tickets, or pick them up at Skateworld during normal business hours. See you at Skateworld!